One of the points I tried to emphasize in my talk about libraries and civic engagement (PDF) at last month’s Allen County Public Library’s Library Camp is that this isn’t a new role for us. 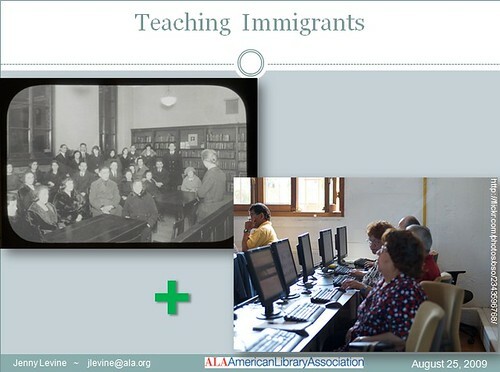 The easy, soundbite way to explain this is to note that at the turn of the previous century, one of our major roles was to help immigrants assimilate into American society and learn how to be U.S. citizens. At the turn of the current century, there’s a similar need for us to do the same thing for digital immigrants, in no small part because there really isn’t anyone else to help those folks who are past high school age. I’ve been gravitating towards this topic lately because I see so much potential, for both libraries and society, and the following idea makes total sense to me. Sadly, like the 2006 MacArthur report about participatory culture, the 2020 effort includes libraries in that future only as afterthoughts, no more than potential support resources, rather than central, driving figures. While I applaud efforts like MacArthur’s digital learning in education initiative and the 2020 Forecast, I remain convinced that as a society, we’ll have a much greater impact on civic life for a greater range of people by focusing on libraries as the primary change agent, not schools. We’re already well-positioned in our communities to be the conveners for this type of activity, we have a library ecosystem for lifelong learning that includes adults (not just K-12 students), we have supporting resources (not just technology, but context), we teach how to navigate information, and we’re the last, safe, non-commercial space that’s open to anyone without any barriers. In fact, quite a few sections of the 2020 site scream “libraries” to me, and I encourage you to read through the various sections. So while I’m intrigued by and fully support the idea of schools encouraging “innovation journalists,” those programs won’t reach their full potential – nor will the students – without libraries to support them. And when those students get out into the real world, libraries can facilitate their non-school efforts. And we can bring them together with the rest of the community to put those new civic literacies into practice for everyone. And don’t get me started on the participatory divide…. what form of payment will you put in a vending machine in 2059? what music that we listen to today, will people still be listening to 100 years from now in 2109? more importantly, how will we be listening to music 100 years from now? will it just appear in our heads? will it still come from speakers? –> what systems are we employing today that are the equivalent of Roman Numberals? what technologies are at Maximum Freud anymore? in what year will the last printed book be published? at what point, is it too expensive for libraries to circulate print books? when do ebook readers become so ubiquitous that it no longer makes sense to print ink on paper? what does a book look like in the future? 10. only 14% of all college graduates live in the U.S.
how long will it be before people can get a Ph.D without being literate? is reading the ultimate information experience? are books a technology equivalent to roman numerals? what is the most important thing I should be learning today? what’s the primary inflection point for change? how do we create the ultimate information experience in libraries? if you were to design a library for these people, what would it look like? what features would it include? remote office space? a telepresence room? what did it sound like to drive down Main Street? what did it smell like? very little outbound communication – need to change that; weekly online newsletter? how do we capitalize on epiphanies?